Auditory illusions, like optical illusions, are tricks of the mind. These illusions come in a variety of forms and can have a number of applications. This post will explore some of these illusions along wit some of the of applications in which they have been intentionally integrated. The aim is to cover some of the breadth of this extensive subject and not necessarily its depth. The world is full of information, whether it be auditory or otherwise. There is such a plenitude of it that we couldn’t possibly consume and process it all, nor should we. Of all the sounds we could hear at any given moment the majority of it is irrelevant to our interest and survival. As a result, over the millennia our species has evolved a sensitivity to the sounds that matter to us the most both anatomically and psychologically; our ears, for instance, can detect a significant range of sound frequencies ranging from approximately 15 Hz to upwards of 20kHz but are most sensitive to those sounds frequencies created by the human voice and the rustling of everyday objects. Even with this subset of the sound spectrum, most of it is still irrelevant in our day-to-day life. To contend with this, we have also evolved the ability to focus on particular sound frequencies within this range while ignoring the rest. This feat occurs both consciously and subconsciously. One example of conscious select perception is our ability to pick a voice out of a crowd, subconsciously, we also react to the distressed screams of a young child. The utility of our mental ability to emphasize certain sounds is difficult to overstate. It is easy to understand the usefulness of being able to determine the direction of a sound or to awaken in fear at the sound of movement before you are even certain you heard it consciously in the first place. Even with the plenitude of auditory information that bombards us daily, the sounds that are potentially useful to us can oftentimes be incoherent or incomplete. These sounds can be overshadowed by a louder sound, or garbled due to a sea of noise, or perhaps even distorted due the source of the sound being in motion. Regardless of these distortions, we’ve also evolved the ability to automatically correct these problems, among others, to differing degrees. This ability is hard-wired into us to such an extent that we couldn’t tum it off even if we tried. With such an inherent, vitally useful ability it is no surprise that it has taken up a permanent residence in our consciousness. There is a downside to this fundamental ability. Sometimes our mind attempts to “correct” certain sounds that did not require it to begin with. This over-compensation distorts the sound being perceived, leaving our conscious mind to believe it is hearing one or more sounds in a way that betrays their original nature, hence becoming an auditory illusion. This drawback can sometimes be exploited though by musicians and others in intentionally in order to create a number of auditory effects for some purpose. Perhaps the number one most utilized auditory illusion is that of the Auditory Gap. The Auditory Gap illusion works in a way similar to how our eyes do when we watch a movie or other animation. If a particular sound is interrupted for a sufficiently short period of time before being resumed, we will be unable to perceive the “gap” that existed. If the gaps remain short while the interspersed sounds remain long enough, an indefinite number of gaps could exist in the sound without being detrimental to our ability to perceive it. This auditory illusion is fundamentally important to the recording and playback of digital sound. When a sound is recorded, it is done so in a significant number of small parts, called samples, and recreated later through a speaker of some form. When performed properly, this sound playback would contain audio gaps imperceptible to our hearing. Another intriguing trick of the ear is an illusion referred to as a Shepard Tone. 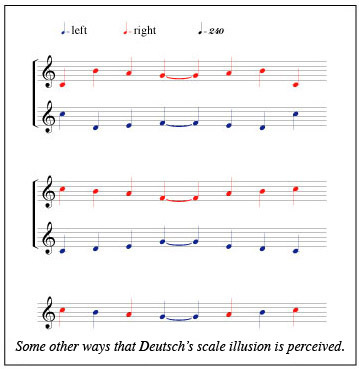 This illusion involves creating and playing a cycled tone scale at different volume ranges, and as the notes change, the loudness is shifted so that either the high or the low note is gradually faded out (depending on the direction chosen) while the inverse is gradually faded in. When performed properly you’ll get a sound which seems to either rise or fall indefinitely. This auditory tick has been used to some degree in a number of classical performances including J. S. Bach’s Fantasia from Fantasia and Fugue in G Minor, for organ. Additionally in the game Super Mario 64: The Endless Stairs. The reason this illusion works the way it does is two-fold. First, our built-in sound correction ability mentioned earlier groups similar pitches together by assuming they are coming from a single source. As a result, one ear perceives the higher pitches and the other ear perceives the lower pitches. So two different sounds sources are still being “heard” in some form though they are now in the wrong ears as they are mixed up. The second portion of this illusion builds upon the first. When two or more sounds are synchronized with each other in time and start/end simultaneously, our built in correction mechanism generally assumes that they came from a single source and it “corrects” the sounds by blending them together, resulting in either a smooth scale of sound (as in the example presented above) or by removing the perception of there being two differing sources at all (more info). Experiencing auditory illusions are commonplace events in our lives. We overlook these illusions as they are generally beneficial such as in the case of filling in the gaps of “broken” sounds, or by taking a particular voice of interest and bringing it to the of an ocean of noise. We have an uncanny ability to deduce what is usually correct in what we hear on a normal basis. These are still deductions on imperfect information, and as was shown in some of the more exotic examples in this post, sometimes this deduction can be wrong. Being wrong does not mean it is potentially harmful though. In the case of digital music recording for instance, our own physical shortcoming and built-in deductive ability has allowed this technology to flourish whereas if we were more capable acoustically (like bats perhaps?) this very thing we take pleasure from may have been perceived as an incessant noise of broken notes and pops the way a badly damaged record may sound.